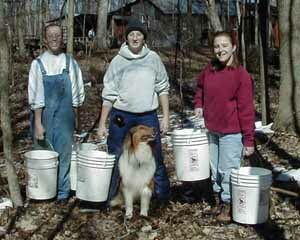 For five generations members of the Yoder family have made maple syrup in the family sugar bush located in northern Allen County, Indiana near the Cedar Creek valley. For more than two decades we joined with the Merry Lea Environmental Learning Center of Goshen College to provide a day-long participatory experience in maple sugaring for elementary students in the Fort Wayne area. 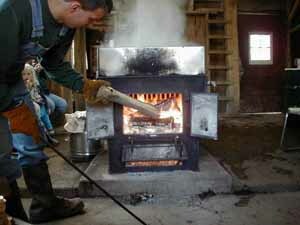 That program ended with Sugar Bush 2012. Going forward, we will continue to sugar on a smaller scale with the help of friends and family members, and we will continue to make pure maple syrup available to our retail customers in the Fort Wayne area. 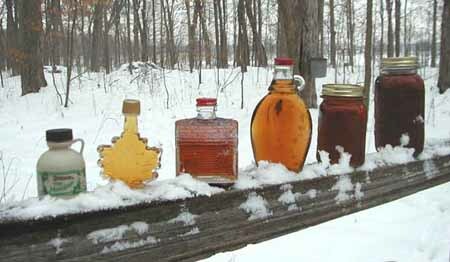 We are active members of the Indiana Maple Syrup Association. Why we pack in glass. 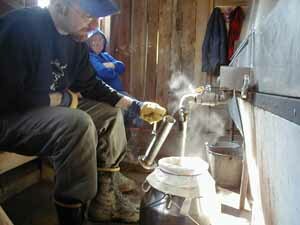 Our sugaring season runs from mid February to the end of March. Syrup is available until our supply is exhausted. 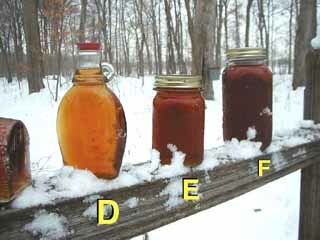 If you would like to purchase syrup when you visit, the following selections are available during the season. Availability of sizes, quantities and grade will depend on the season and nature of the run. Sorry, in the middle of the woods we are not equipped to accept credit cards.